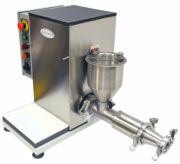 Model LE-2 and LE-2.5 Laboratory Soap Extruder/Refiners are bench top units used for making small soap bar samples. The machines are compact and require only single phase 115 volt electrical service (or 230 single phase at 50 hz). Plumbing is not needed.